Every good gift and every perfect gift is from above! Carol, I, and the RAU team praise God from whom all blessings flow! To be here serving the Lord and His people is such a privileged and honor. I also know we could not be here without your prayers,support, and Lifegate which has sent us out. We are grateful for you and by God’s grace will be here a long time serving Christ Jesus. 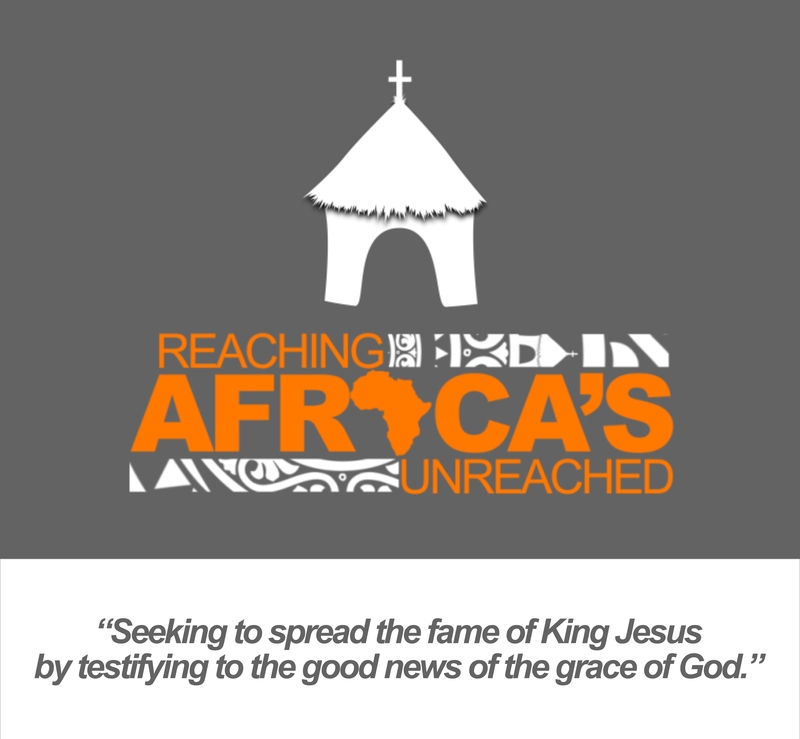 Lord willing we will be able to partner with you for many years in spreading the fame of King Jesus across Africa! Before going to some updates let me open with a couple of questions which you may have thought about from time to time, What do missionaries do? and What is the fundamental purpose of “Missions”? These are important questions and ones I have pondered many times ever since my discussions on the topic with Leonard Ravenhill back in 1977. I have noticed a trend over the years and that being the answers to these two questions have been broadened greatly. I appreciate and am grateful for everything good which has done for the glory of Christ in the name of missions but I don’t think that the broadening of definitions of “missionary” and “missions” has been particularly helpful to the churches call to “make disciples of all nations (people groups)”. To keep this newsletter from becoming to long may I point you to an article which Kevin DeYoung wrote. I re-posted it at the RAU blog. The article is entitled “The Goal of Missions and the Work of Missionaries”. The article is well written and bibilcally answers the before mentioned questions the the way I think they should be answered.There may be those who disagree with DeYoung’s conclusions. I do agree with DeYoung. I think it is helpful for you our partners to understand my heart as well as RAU’s primary mission and calling. I hope that you will take the time to read the article. 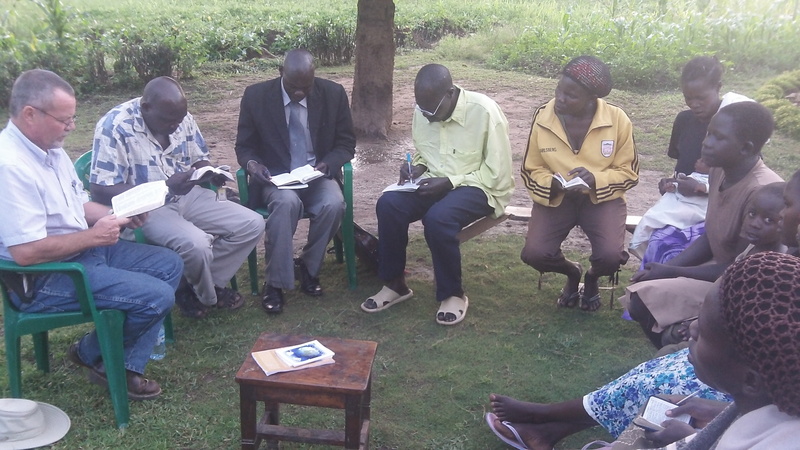 Since Reaching Africa’s Unreached founding in 2010 we have been working towards hosting groups for discipleship. Our goal has always been to bring to RAU groups of pastors, evangelists,church leaders, and church planters for times of refreshing and teaching in the fundamentals of the faith, especially the gospel. The primary work which we have been doing the past years along with Carol’s and my first days here has been for this purpose. Since Carol’s and my arrival at RAU six days a week from sunrise into the evenings we and others have been laboring to get the facilities ready for what we have called Phase I. Sunday mornings and early afternoons are reserved for worship/preaching in local churches and Sunday evenings for outdoor evangelism in the mode of George Whitefield and John Wesley. Open air preaching in the Afoji market. I preached in English then it was translated into Madi and KuKu. Along with helping out on the physical work I have also been working on teaching lessons. Currently I am making up questions and a study guide for Paul Washer’s book The Gospel’s Power and Message in his Recovering the Gospel Series. I am hoping to make it one my my main text books. 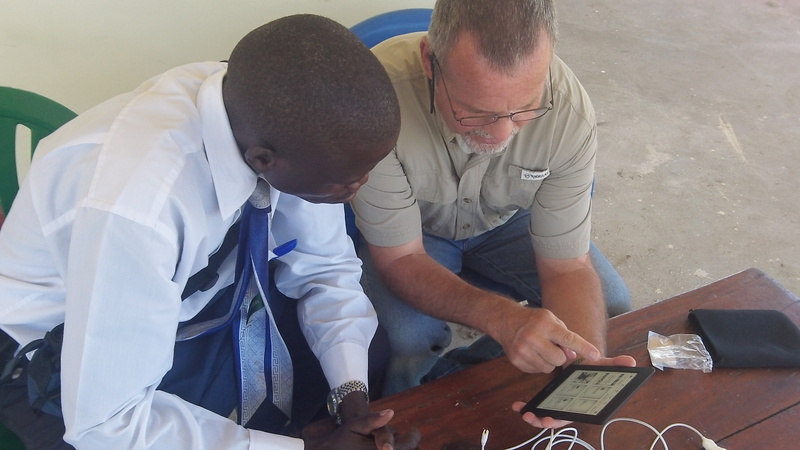 Getting solid literature to pastors continues to be one of our longstanding goals.I have a post at the RAU blog about our partnering with “Study To be Approved” in placing Kindles loaded with godly literature into pastor’s hands. Please take a few minutes to read it at some point. As the Lord provides resources and called/equipped personal we will also seek to show Christ’s love through medical work, education, and care for orphans. 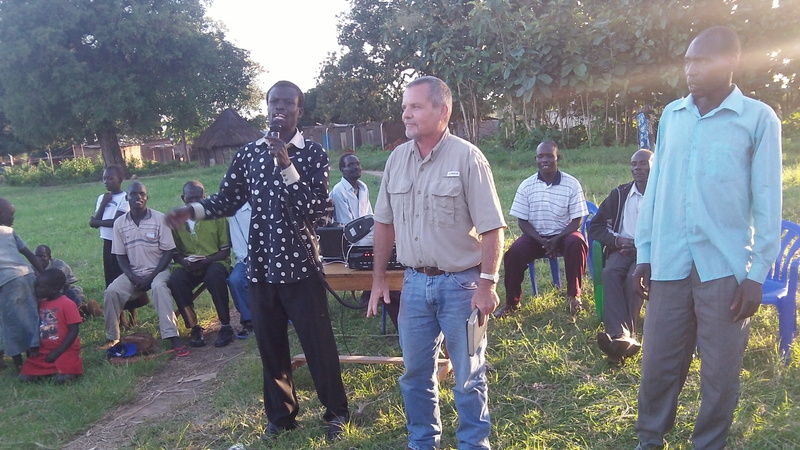 However, RAU’s primary calling is to discipleship and helping to spread the gospel through church planting in unengaged villages and people groups of the area. We are purposing to host our first retreats for groups of pastors, evangelists,church leaders, and church planters sometime in September. Our goal is to bring small groups of them in for one on one Bible study from Tuesdays through Fridays. We will put them up, feed them, and help in some of their transport cost. As near as we can now figure it will cost around $500 to do this per group. However, we still have a number of upfront costs for things like beds,mattress,mosquito nets etc. as well as the other things I have mentioned in past newsletters. From the last week of October to the first week of December we will be hosting three American teams and one from Kampala. They are coming to share their God given gifts. We look forward to hosting them and many in the future as well. 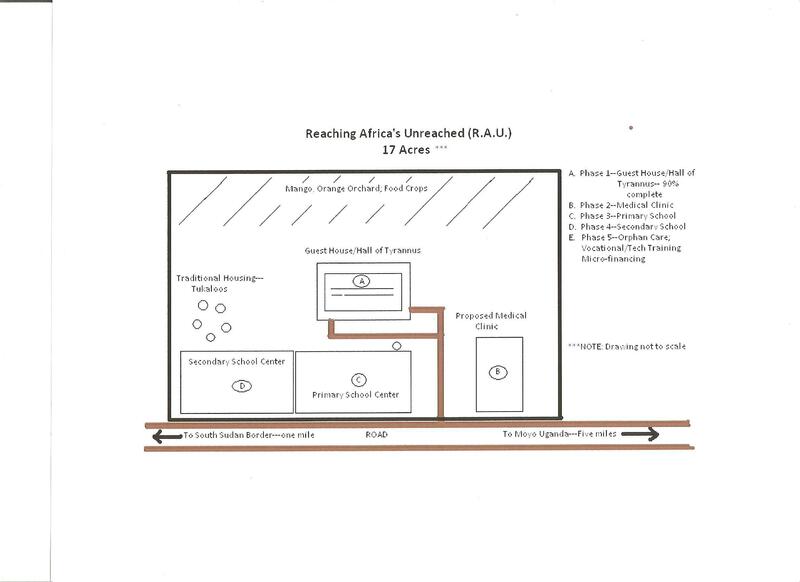 Please continue to pray for the RAU container on its way to us. It is probably somewhere on the Atlantic Ocean. Please also pray for Gabby Bukenya, Patrick’s and Vickie’s 4 yr. old daughter, who is having heart surgery in California. Carol escorted her there and currently is enjoying family in Stephenville Texas. Carol will fly out of Dallas on Monday. Please pray for her safe journey back to RAU. 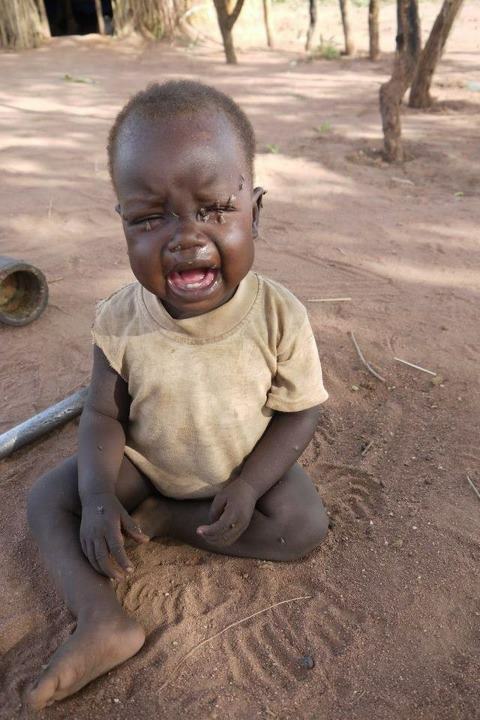 The most difficult part of the journey is from Gulu to here. 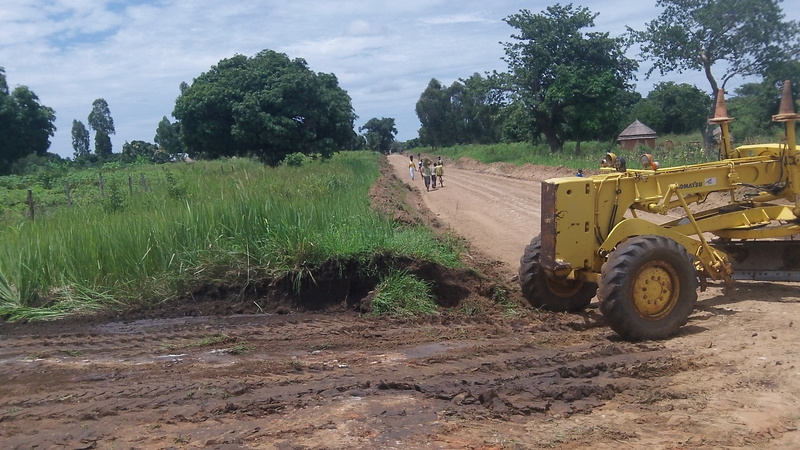 We had a truckload of building supplies which left Kampala for us three days ago and it is still not here because of a combination of the roads north of Gulu and a break down while trying to go up the steep hills from the Nile River to Moyo. Please pray for the ongoing work to be ready for groups in September and give if you can to help make it happen. Currently our account is quite low. I hope that in your reading of these needs you do not feel undue pressure to give. Please give only as you are led of the Lord to do. God has been marvelously providing for us and we know He will continue to do so. Also it is our desire that any gifts given to R.A.U. would not compromise what you are ALREADY giving to your local church or to foreign missions . To get the gospel to the unreached will take sacrificial giving on the part of all God’s people. May we all walk faithfully in the spirit of 2 Corinthians 8 & 9 so that our Lord God is worshiped by men and women from every tongue , tribe, people, and nation! Most importantly we ask that you stand with us in prayer! 1. Finishing up the refurbishing of our four existing tukalus on the land. The four have now been roofed with new grass. To repair the doors, windows, and plaster them will require an additional $600. We have purchased the materials for the doors and windows and now are working on them. 2. 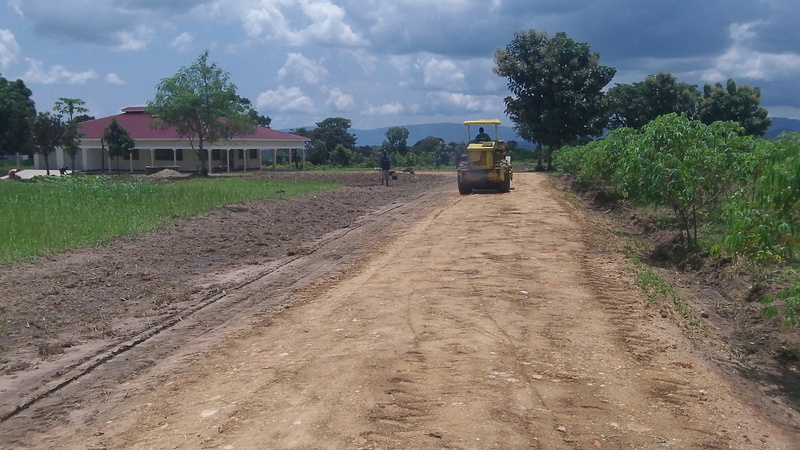 The building of 4-5 more tukalu’s to house pastors/evangelists/church planters for discipleship. Each tukalu can take care of 4-5 people and they are inexpensive to build. To build one tukalu is around $500. 3. $1000 to dig a new double stall pit latrine for the tukalu quarters with an outdoor bathing facility. The existing pit latrine is about to cave in and there is no place to bath. 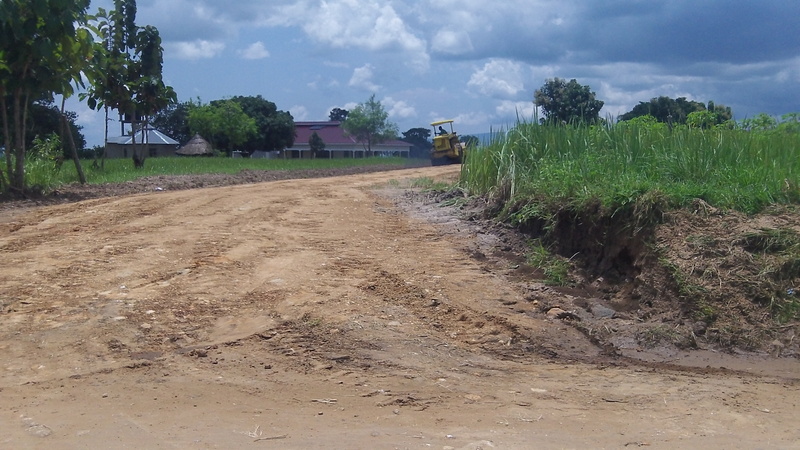 (See our previous newsletters on the reason we are building these tukalu quarters ). 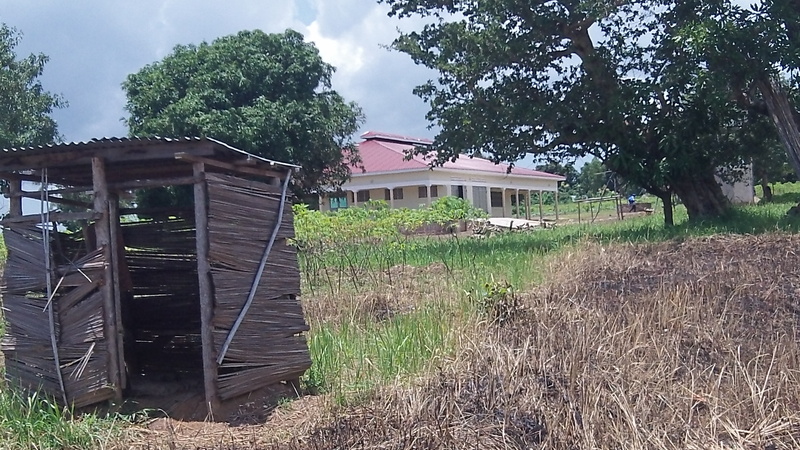 The current latrine for tukalu’s. 4. $4,000 for an outdoor kitchen and attached living quarters (one small room and bathroom) for Lucy, our cook/helper. The current one is about to fall down is some distance from the Guesthouse. 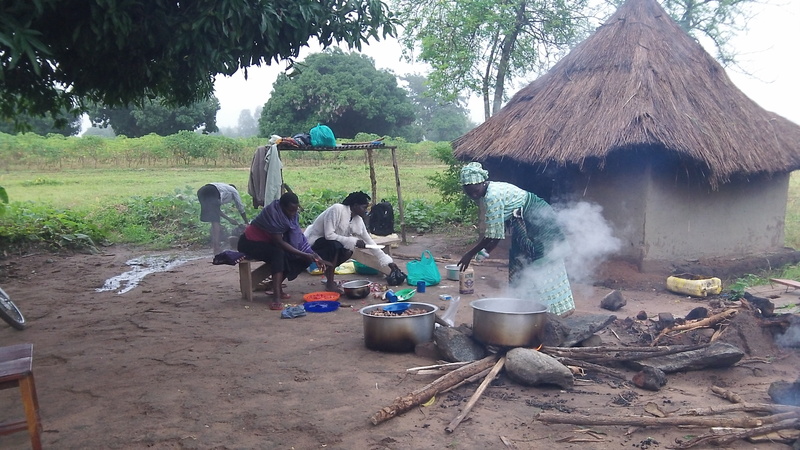 As stated in an earlier newsletter we need an outdoor kitchen to be able to cook for large groups with wood and charcoal. To get propane gas for our indoor stove is hard to obtain and expensive. It also opens up the room Lucy is now staying in for guests. 7. In a past newsletter I wrote of my near encounter with a cobra in our kitchen. Since then we have doubled our efforts in clearing around the Guesthouse and making sure there are no holes or places under doors for them to squeeze in! The main reasons it was easy to kill the cobra while in the kitchen and perhaps why it did not strike my foot which was only an inch away from my bare foot was because it was on our tile floor. Because of kitchen’s slick tile surface it was difficult for a snake to move.Around the the Guesthouse we have 10 foot veranda on three sides and it is 15 feet in the front. Because of what we have learned about a snake’s ability to move on tile we would like to tile our veranda to create an extra barrier between the Guesthouse and snakes! It would also make it easier to clean. The estimation to do this tile work is $3000+-. Please continue to pray for everyone’s protection and good health. There is a lot of demonic activity in our area. 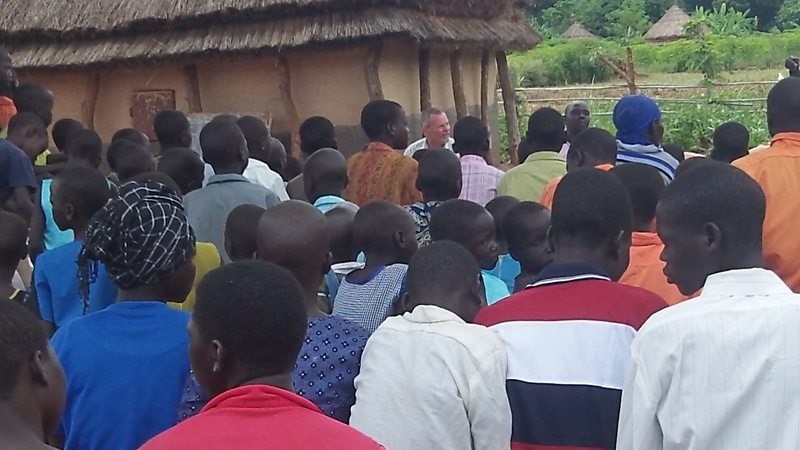 For example, just recently a businessman from Afoji market went across the nearby border to South Sudan to do some business.The Afoji market is very close to us and it is where I did open air preaching this last Sunday night. While the businessman was there a man put his hand on his shoulder and said out loud to him in front of many “If I die tonight it will be your fault”! That very same night the man who placed his hand upon the man’s shoulder died by lightening strike. The next day the people who heard what was said to the businessman the earlier evening caught the Afoji businessman whom they believed cause the death by lightning. After catching him they then stoned him and then mutilated him. All this took place just a couple miles from RAU. The devil has come”to steal,kill, and destroy” and “our battle is not with flesh and blood…“. Please be vigilant in your prayers that Lord break the chains of the evil one and grant us protection from his schemes. Thank You! This biblically grounded article is so well written I must pass it on to you! Thank you Kevin DeYoung! Acts 14:19-28 But Jews came from Antioch and Iconium, and having persuaded the crowds, they stoned Paul and dragged him out of the city, supposing that he was dead. But when the disciples gathered about him, he rose up and entered the city, and on the next day he went on with Barnabas to Derbe. When they had preached the gospel to that city and had made many disciples, they returned to Lystra and to Iconium and to Antioch, strengthening the souls of the disciples, encouraging them to continue in the faith, and saying that through many tribulations we must enter the kingdom of God. And when they had appointed elders for them in every church, with prayer and fasting they committed them to the Lord in whom they had believed. Then they passed through Pisidia and came to Pamphylia. And when they had spoken the word in Perga, they went down to Attalia, and from there they sailed to Antioch, where they had been commended to the grace of God for the work that they had fulfilled. And when they arrived and gathered the church together, they declared all that God had done with them, and how he had opened a door of faith to the Gentiles. And they remained no little time with the disciples. I hope in this blog to answer one simple question: What do missionaries do? The question is simple, but coming to an answer is not. In recent years there has been a great deal of conversation in mission literature about what exactly we mean, or ought to mean, by “mission,” “missionary,” or the newer term “missional.” I wrote a book with Greg Gilbert in an effort to throw our two cents into the conversation. The issues are complicated, not least of all because it is no longer self-evident what we mean by words like missions or missionary. Although Christians use these words all the time, if we were forced to provide a careful definition for them, we would find, I think, quite a diversity of opinion. For some people “missions” means nothing but evangelism, while some ecumenical organizations would rather have mission include every good thing the church might do except seeking the conversion of the lost. Is creation care mission work? What about teaching people to read and write? Or agricultural development? Or medical care? Or digging wells? Or orphan work? What if people do these things in Jesus’ name? What if these activities are part of a broader work or serve as the means to a larger end? Coming to an understanding of what constitutes “missionary” work is not as easy as it sounds. Let me add a clarification at this point. In asking the question “what do missionaries do?” I am not thinking about the specifics of their day to day lives. I’m not going to try to describe all the particularities of what it looks like and feels like to be a missionary on the field. I would not be the best person to address that topic and it’s not what we find at the end of Acts 14. I want to approach the question higher up and further back. I want us to think theologically about the tasks, the aims, and the purposes of mission work, and in so doing look at the responsibilities of missionaries. What should the men and women right now serving in the world as missionaries have as their ministry goals? What kind of work should churches expect, encourage, and pray for in their missionaries? What should mission committees and mission budgets look for in determining which mission organizations and which missionaries to support? These are important questions and very practical questions. And they cannot be addressed until we answer the first question: what do missionaries do? If we are to answer that question, we must first have some general understanding of what we mean by the word “missionary.” Obviously, we can’t fully define the word without determining what these people do. But we should at least try to get in the definitional ball park. At the most basic level, a missionary is someone who has been sent. That’s what the word “mission” entails. 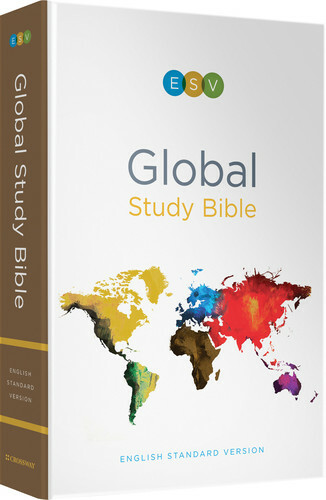 It may not appear in your English Bibles, but it’s still a biblical word. Eckhard Schnabel—who, with two 1000 page volumes on Early Christian Mission and a 500 page work on Paul the Missionary, is one of the world’s leading experts on mission in the New Testament—makes this point forcefully. The apostles, in the broadest sense of the term, were those who had been sent out. Linguistically, this sent-outness is also the first thing we should note relative to the term missionary. It is, after all, the first thing Jesus notes about his mission–that he was sent to proclaim a message of good news to the poor (Luke 4:18). Being “on mission” or engaging in mission work suggests intentionality and movement (Paul the Missionary, 22, 27). Missionaries are those who have been sent from one place that they might go somewhere else. Every Christian–if we are going to be obedient to the Great Commission–must be involved in missions, but not every Christian is a missionary. While it is certainly true that we should all be ready to give an answer for the hope that we have, and we should all adorn the gospel with our good works, and we should all do our part to make Christ known, we ought to reserve the term “missionary” for those who are intentionally sent out from one place to another. It’s important to remember that the church (ekklesia) is by definition the assembly of those who have been called out. Our fundamental identity as believers is not as those who are sent into the world with a mission, but as those who are called out from darkness into his marvelous light (1 Peter 2:9). As Schnabel says about Acts, “[Luke] never characterizes ‘the church’ as an institution that is ‘sent’ to accomplish God’s will. Luke reports that a local congregation ‘sends’ leading preachers and teachers as ‘missionaries’ to other regions (see Acts 13:1-4), but the church itself is not portrayed as being ‘sent’” (Early Christian Mission, 1580). Missionaries, therefore, are those unique persons called by God and sent by the church to go out and further the mission where it has not yet been established. We are coming close to getting back to Acts 14:19-28 and answering the question “what do missionaries do?” But there is one more preliminary step we must take before landing in this text. I need to make the case that the book of Acts is the best place to look for the answer to our question, and that the end of Acts 14 in particular is an especially helpful place to look. It wouldn’t be fair to answer our question about missionaries from the book of Acts and from Acts 14 unless there is good reason to think this book and this text means to answer this sort of question. Let’s start with the book. Acts is the inspired history of the mission of the church. It is meant to pick up where Luke’s Gospel leaves off—which is with Jesus’ command that “repentance and forgiveness of sins should be proclaimed in his name to all nations” and with the promise that he will send the Holy Spirit to clothe the disciples with power from on high so they can be his witnesses (24:47-48). The same narrative is in view in Acts 1 as the church is gathered in Jerusalem waiting for the promised Holy Spirit (Acts 1:4). This second volume from Luke will describe what those commissioned at the end of the first volume were sent out to accomplish. And we have good reason to think this passage in Acts 14 is an especially good place to get an answer to that question. At the beginning of Acts 13 the church at Antioch, prompted by the Holy Spirit, set apart Paul and Barnabas “for the work to which I have called them” (v. 2). The next verse says, “Then after fasting and praying they laid their hands on them and sent them off” (v. 3). This isn’t the first time the gospel is going to be preached to unbelievers in Acts. It’s not the first gospel work Paul and Barnabas will do. But it is the first time we see a church intentionally sending out Christian workers with a mission to another location. Paul and Barnabas travel to Cyprus, and then to Pisidian Antioch, and then to Iconium, and then to Lystra, and then to Derbe, and from there back through Lystra, Iconium, and Pisidian Antioch, and then to Perga, and back to Antioch in Syria. This completes Paul’s first missionary journey. So Acts 14:19-28 is not only a good summary of Paul’s missionary work, it’s also the sort of information Paul would have shared with the church in Antioch when he returned (v. 27). These verses are like the slide show or the power point presentation Paul and Barnabas shared with their sending church: “This is how we saw God at work. Here’s where we went and what we did.” If any verses are going to give us a succinct description of what missionaries do, it’s verses like these at the end the missionary journey in Acts 14. Nurtured churches – “strengthening the souls of the disciples, encouraging them to continue in the faith” (v. 22). To be sure, Christian missionaries may be more active in one aspect of this work rather than another. But all mission work must keep these three things in mind. If the apostles are meant to be our models for what missionaries do—and as the sent-out ones tasked most immediately with the Great Commission, there is every reason to think that they are—then we should expect our missionaries to be engaged in these activities and pray for them to that end. The goal of mission work is to win new converts, establish these young disciples in the faith, and incorporate them into a local church. Schnabel describes the missionary task with an almost identical set of three points. Evangelism, discipleship, church planting—that’s what the church in Antioch sent Paul and Barnabas to do, and these should be the goals of all mission work. Missionaries may aim at one of these components more than the other two, but all three should be present in our overall mission strategy. The work of discipleship and church planting cannot take place unless some non-believers have been evangelized and some of them converted. At the same, we cannot leave new converts on their own once they come to Christ. They must be grounded in the faith and taught what it means to turn from sin, flesh, and the devil and follow Jesus. And if our missionary work only focuses on evangelism and discipleship, without a vision for the centrality of the local church, we are not being faithful to the pattern we see in Acts where conversion always entails incorporation. Missionary work is a three-legged stool: if we are missing any of the legs, the ministry will not be healthy, stable, or strong. Of course, in saying that all missionaries should be engaged with these three components, I am not suggesting that the strategy is always simple and straightforward. We have to be patient and flexible in aiming for these goals. It make take years to learn a new language and win a hearing with the people you are trying to reach. You may be a doctor or nurse or teacher or business person or agricultural expert by trade. And yet, your bigger, longer-lasting goal is to win people to Christ, get them rooted in their faith, and make sure the new indigenous church is firm and established. In today’s world, reaching the least reached people takes risk, creativity, and patience. Acts does not give us just one way to do mission work. But it does show us the work missionaries do. On the one hand, we want to avoid the danger of making our mission too small. Some well-meaning Christians act like conversion is the only thing that counts. 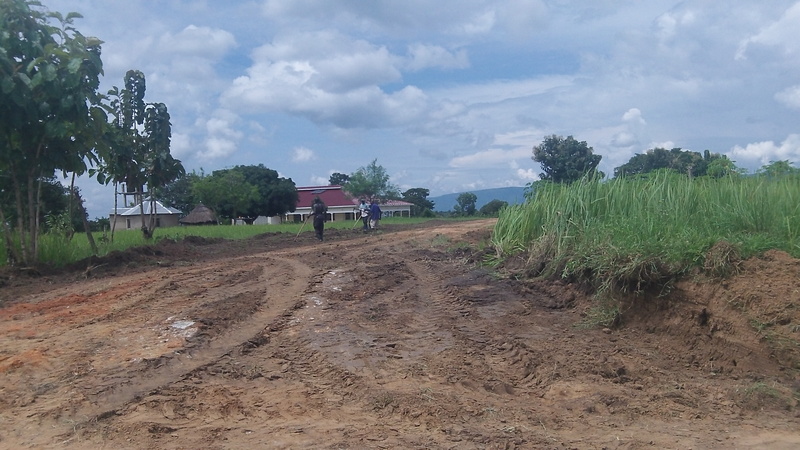 They put all their efforts into getting to the field as quickly as possible, speaking to as many people as possible, and then leaving as soon as possible. Mission becomes synonymous with pioneer evangelism. On the other hand, we want to avoid the danger of making our mission to broad. Some well-meaning Christians act like everything counts as mission. They put all their efforts into improving job skills, lowering unemployment, digging wells, setting up medical centers, establishing great schools, and working for better crop yields—all of which are important and can be a wonderful expression of Christian love, but aren’t what we see Paul and Barnabas sent out to do on their mission in Acts. I have no doubt God gifts some of us and calls some of us to care for orphans in other lands, or help people develop better sanitation practices, or help sick people with very little access to medical care. We should celebrate these callings. Full stop. With our full support. We may even give financially so that Christians can go and love their neighbors in these extravagant ways. And at the same time, without denigrating this good work in slightest, we must conclude from Acts 14:19-28, and from the entire book of Acts, that the church’s mission and the work of our sent-out missionaries is something more specific. Those demanding a “revolution” in our understanding of mission “away from the traditional missionary focus on winning people to faith in Jesus Christ, concentrating rather on a ‘holistic’ understanding of Jesus’ claims” do so without strong textual support (see Early Christian Mission, 1580-81). We see over and over in Paul’s missionary journeys, and again in his letters, that the central work to which he has been called is the verbal proclamation of Jesus Christ as Savior and Lord (Rom. 10:14-17; 15:18; 1 Cor. 15:1-2, 11; Col. 1:28). Paul sees his identity as an apostle—as a sent-out one—to be chiefly this: he has been set apart for the gospel of God (Rom. 1:1). That’s why in Acts 14:27 the singular summary of his mission work just completed is that God “had opened a door of faith to the Gentiles.” Paul’s goal as a missionary was the conversion of Jews and pagans, the transformation of their hearts and minds, and the incorporation of these new believers into a mature, duly constituted church. In their book Salvation to the Ends of the Earth: A Biblical Theology of Mission, Andreas Kostenberger and Peter O’Brien describe what it would look like “if the apostolic model is to be followed by missionaries in the contemporary scene.” The work of these missionaries would begin with the winning of converts, but it would not stop there. So what do missionaries do? They preach the gospel to those who haven’t heard. They disciple new believers in life and Christian doctrine. 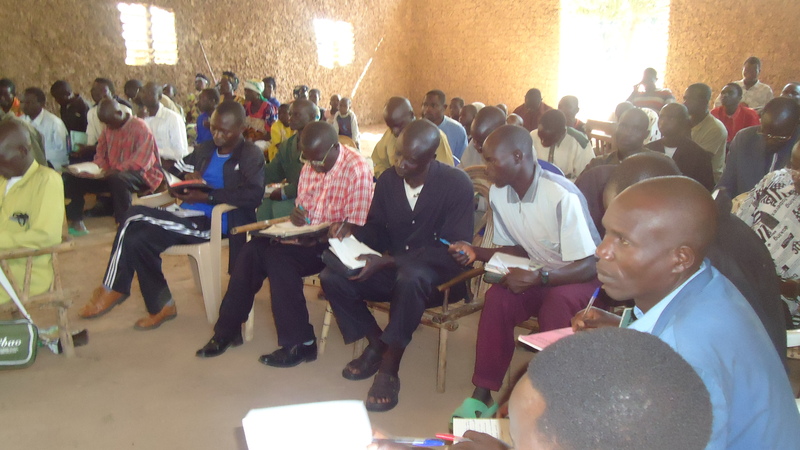 And they establish these disciples into healthy churches with sound teaching and good leaders. Let me finish by suggesting a few implications which follow from this answer and then make one final observation from the text. Implication #1: Those currently serving as missionaries should consider whether Paul’s priorities are their priorities. I’m not trying to single out any specific missionaries who may come across this post. But as a general diagnostic tool missionaries would be helped by considering whether their aims look like Luke’s summary of Paul’s aims at the end of Acts 14. For some, this may be a gentle reminder and encouragement to stay the course and keep doing the good work they are doing. For other missionaries, it may mean a serious re-evaluation of their priorities. Perhaps they’ve wandered from their charge, maybe lost sight of their original aims and goals. Any of us can experience mission creep or mission drift. It happens in businesses. It happens in churches. It happens in schools. And it happens on the mission field. You have one set of purposes in mind when you land, and then years later you’ve veered off into something else entirely. Implication #2: We should aim with our missions budget to support missionaries who have for their goals the things we see in Acts 14:21-23. There is certainly a place for Christians to support all manner of good works, development programs, and initiatives designed to work for human flourishing. Many of us will choose to support these ventures personally from our own finances. A few of them may even be in the church budget as a kind of diaconal ministry toward those in our community or for those in need around the world. But when it comes to supporting missionaries in the mission budget, we ought to expect that they are aiming for, praying for, and working for the same things that describe the mission of Paul and Barnabas in verses 21-23. The work of the sent-out apostles should bear a strong resemblance to the work of our sent-out missionaries. We are finite creatures with finite time, finite resources, and finite abilities. Therefore, our mission strategy must have priorities. This means first of all, we want to support godly men and women, mature in their faith, and like-minded in their theological convictions. Second, this ought to mean we look to support those doing work in the three areas of missionary activity we see in Acts—evangelism, discipleship, and church planting. And third, once the first two points have been firmly established, I believe every church should keep two further questions in mind. Where is the greatest need? What are our greatest strengths? These two question won’t make all the hard decisions easy, but they give us a place to start making hard decisions. Paul’s goal was to reach as many people as possible with the gospel. He made no distinction between men and women, slave and free, rich and poor, educated and uneducated, majority or minority. He wanted all to hear of Christ and was eager to go where Christ had not been named (Rom. 15:17-23). Considering almost three billion people have no access to the gospel and there are still 7000 unreached people groups, we should be especially burdened to send missionaries and support missionaries where Christ is least known. And along with this priority of greatest need, I believe it’s wise to consider our greatest strengths. What abilities and interests do we have in our church? What do we have a track record of doing well? In what places do we already have strong ties? Where has God opened a door? Theses are the sort of secondary questions we would do well to ask, provided the fundamentals have been established. Implication #3: You should consider whether God is calling you to be engaged in this work, should the church be willing to send you out. I know this post has been heavy on definition and precision and explanation, but perhaps you find your heart exploding with joy and purpose and resolve at thought of gospel-centered, gospel-saturated, gospel-purposed mission work. Maybe you are sitting at your computer thinking, “That’s exactly what I want to do with my life. I want to be report back to this church someday that through my witness God opened a door of faith to the nations.” There is a tremendous need, and we have a tremendous gospel. Could it be that God is calling you to be one of those who connects the two? Talk to your elders, talk to your missions committee, talk to your pastor, talk to a mature friend if you think you might be one of these missionaries we’ve been talking about. I would be remiss if I didn’t direct your attention to the end of verse 22 in closing. We read there that Paul and Barnabas strengthened the souls of the disciples, encouraged them to continue in the faith, and also informed them that through many tribulations we must enter the kingdom of God. A key aspect in their discipleship plan was preparing the people to suffer. And who better to prepare them for Christian endurance than the Apostle Paul? Here we are at the end of just the first missionary journey and we’ve already seen Paul threatened, attacked, stoned, dragged out of the city, and left for dead. 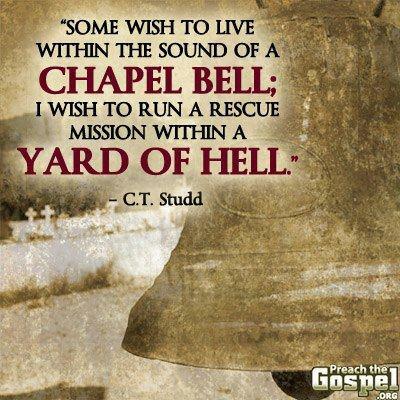 If the call to be a Christian is a summons to carry your cross, how much more the call to be a missionary? In some ways, we have it easier today than Paul and Barnabas did. Travel is easier. Communication is easier. Medical care and hygiene are better. But in other ways, the work of a missionary is even harder. Most of today’s missionaries have a far great cultural gap to cross in their ministry than Paul did in his. Paul didn’t have to learn a new language. He traveled within the borders of the Roman Empire. He ministered among those who shared something of the same educational system and same political tradition, even if the religious history was very different at times. Sending an American to Indonesia or a Korean to Eastern Europe or a Brazilian to West Africa will likely mean greater cross-cultural pains than even Paul knew. In the end, of course, it’s not terribly fruitful to compare missionary work in one century versus another. If we are faithfully proclaiming the gospel to those who do not know him, there will be challenges. There will always be the promise of tribulation and the possibility of even worse. Which means we must be prepared to suffer if we go and be ready to support those whom we send. Missionaries are just like other Christians. They have marriages that need help and kids that need help and conflicts that need help. They are not super heroes. They are servants—servants of God, servants of others, and servants of the word. It’s that last point that may need recurring emphasis in our day. Missionaries must be first and foremost people of the word. They must know it, believe it, announce it, and teach it. That’s why they go. That’s why we send. For how will they call on him in whom they have not believed? And how are they to believe in him of whom they have never heard? And how are they to hear without someone preaching? And how are they to preach unless they are sent? (Rom. 10:14-15). This past Sunday it rained hard all night and into the morning so that the roads were impassible for us to make it to the church we were planning to go to. So Sam and I walked to a nearby village church for its service. The service went from 10:30 to 1:30 with the sermon being about 1 1/2 hours long. I was encouraged by the preacher’s message. I had only met the preacher briefly a few times over the past few years. He preached a very cross centered message and our call to suffer accepting it from God’s hand as a means for our growth! He, like many pastors (99%), has another job. He is also secondary teacher and that is how he supports his family. His English was very good. After the service I asked him if he had been reading anything on the topic . He said he was reading Living The Cross Centered Life by C.J. Mahaney, a book that I had brought here a number of years ago. I am sure it has been passed around many times and eventually made it to him. A copy of “Living the Cross Centered Life” in a church I was in last Fall. 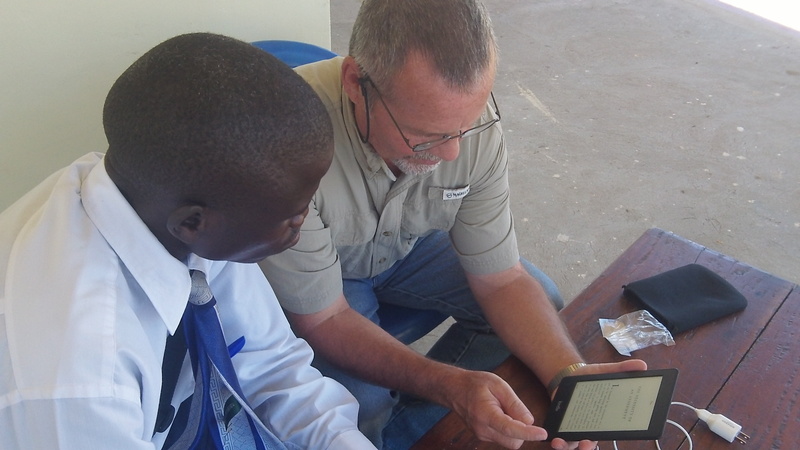 Delmar Hagar, a brother from Texas whom Carol and I met at evangelism conference in Austin Texas just before we left for Africa sent 10 Kindles with us for pastors. He is now sending 10 more with Carol on her return to RAU.! 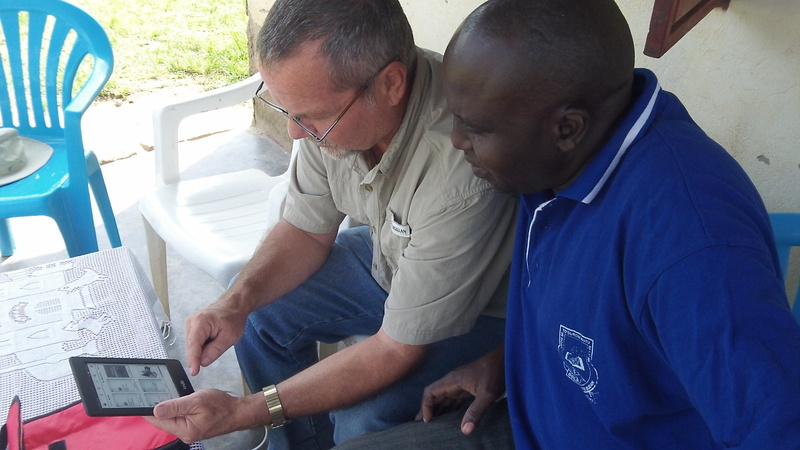 Delmar’s heart is to get biblical, Christ-center literature to English reading pastors. We immediately hit it off as we share that same vision. Each Kindle he gave me has many,many excellent Christ exalting, Biblically sound books on it. They also have the the ESV Study Bible on them. 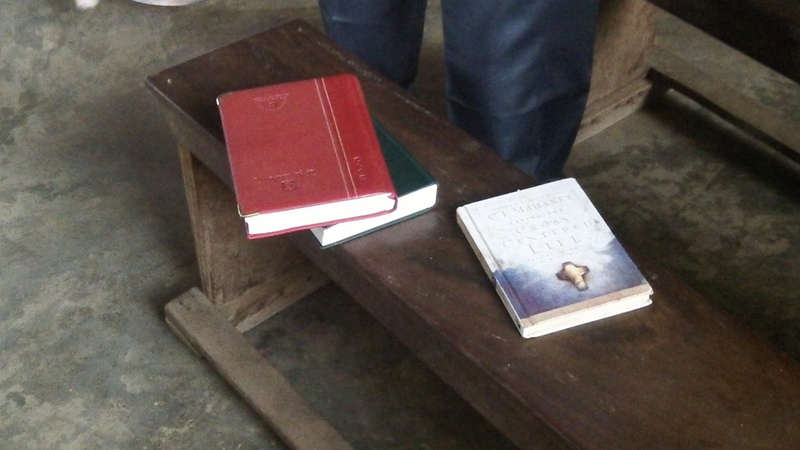 He is the only one who can add books to the Kindles to make sure they are used only for their intended purpose:to strengthen and encourage pastors in the faith. He has just added Paul Washer’s books to the collection so now there are even more excellent books on the Kindles . While listening to the young preacher this morning preach I knew he was an excellent candidate for a Kindle. I invited him to RAU and I shared a Kindle along with how to use it. 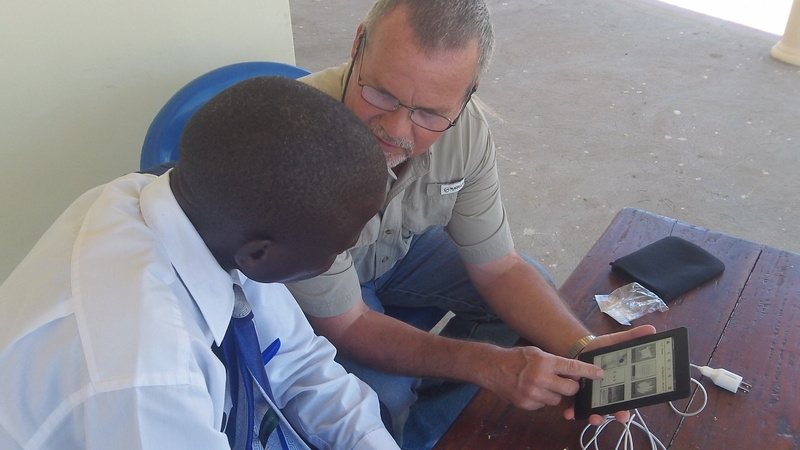 Please pray for the distribution of the Kindles to placed into the right hands and consider supporting Delmar’s Kindle ministry as well as his partners who give them to pastors who hunger for Christ exalting literature in an area of the world where there is a famine for such literature. 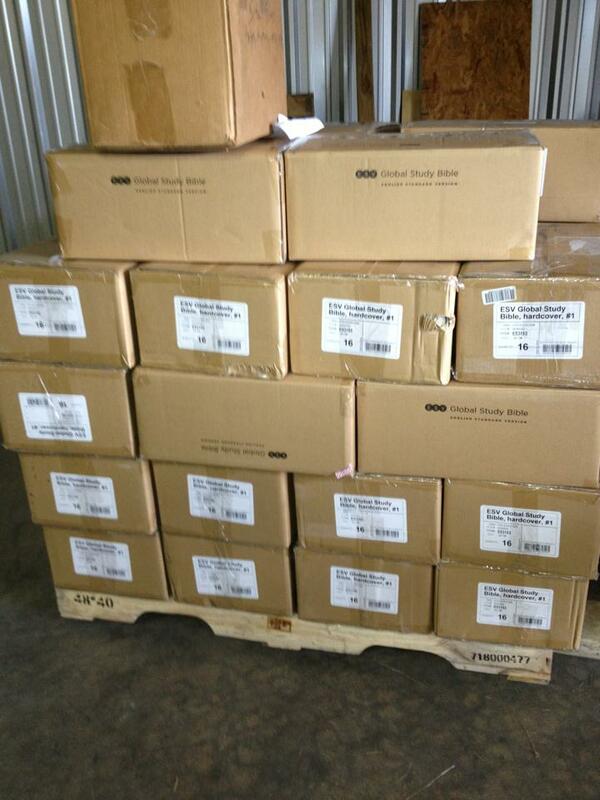 Over 1,100 Global Study Bibles and 3,500 christian books for distribution to pastors and others are on their way ..PTL! We have many reasons to rejoice in our Lord and to be thankful for your prayers and support! Let me briefly share a few of those reasons which have recently come our way. This past week I almost stepped on a cobra! I left Carol’s and my room to go fill my water bottle for the night. As I was filling it in the kitchen I looked down and my bare white shiny foot was just an inch away from from a coiled cobra. I was using my excellent Coast LED flashlight as I had just turned off our solar power system for the night. I am praising God that I “just happen” to shine my light downward to see the cobra right next to my foot and it “just happen” not to strike. I was able to step back and call for back up. Thank you for your continual prayers! . 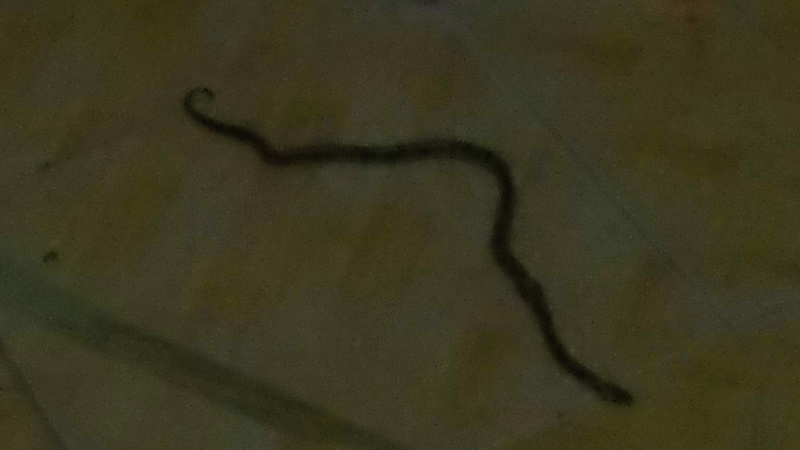 Killed cobra on our kitchen floor. Because of poor lighting the picture is not clear. Thinking back on how we killed the cobra I have to laugh. First, Sam struck wide to the right with a voracious whack which snapped the stick he was using. Then Aldo our guard struck with his stick hitting it in the middle stunning it and then again holding it down with another whack. Then Stephen our other guard stepped on its head with his army boot…dead cobra! We have been hard at work making a good clear perimeter around the house..about 60 yards at the narrowest point. As far as we can tell there are no holes into the house with the exception of the garage doors. We are actually thinking (not that I like this thought) that it may have been in the house all the while we have been here. Our “best guess” is that it was staying in a kitchen floor cabinet which we have not been using and just came out at night Maybe God used my very,very white feet to confuse the cobra but more likely it was because of your prayers and God’s gracious deliverance from “such a deadly peril” ! As you know from our past newsletters Carol was to accompany Gabby Bukenya, Patrick’s and Vickie’s 4 year old daughter, to California for heart surgery.They have arrived safely to Gabbie’s Aunt’s home where Gabbie will be staying. Gabbie and Carol are fine but very tired. They went via Dubai and their flight from Dubai to LA was 16 hours long!! Thank you for your prayers! Please remember to pray for Gabbie! Carol will return here soon via a short stop over in Texas where she will be staying with Kenny, Anna, and our newest grandchild Keira. She will be with them three days in Stephenville. Josh, Becca, Eliza, and Ben are planning to make the trip to Stephenville. Carol is very excited to be able to see them all. In the midst of missing each them very,very much I am very happy that they can have this time together. I will look forward to being able to to do the same thing this coming Christmas. Please continue in your prayers that the Lord would continue to grant us grace in the midst of missing family very much. This is the most difficult hardship we face. We are rejoicing that R.A.U.’s first 40 foot container has left Seguin Texas and is heading our way. It is due to arrive at R.A.U. in mid November. Carol and I have so many great friends and a home church, Lifegate, which is very,very supportive who have helped with this. Without their gifts and hard work this would not be happening. Christ’s love is so evident in their lives for us and Jesus mission (John 20:21)! Thank you to all who donated items for the container and the money to ship it. Thank you to each one who worked on it’s shipping and packing! There were so many things given the packers were not able to get everything in the container and many things had to be left. Lord willing, at some later point another container can be sent. To see everything which was given and pictures of the loading visit this link here. Please pray for its safe arrival to us! Last time I wrote about how the Lord is helping us get ready for the container here at R.A.U.. Being in a remote area of Africa presents unique set of challenges for us! When the container arrives we will first off load it. Then we will have the truck drive to a spot where I will have a slab poured (one of my many projects to complete). We will tie the the back of the container with cables that are in it to the base of a tree. Then the truck will pull forward to drop the container on the slab. The plan is only an idea in my head now, please pray that the idea can become a reality :-)! After R.A.U.’s founding in 2010 and it’s receiving of Ugandan NGO status our first phase has been to purchased land and have a place where pastors,evangelists, church leaders, and church planters could come for refreshment and strengthening in the gospel of grace so that they could be an encouragement to their congregations and actively be a part of spreading the gospel by planting churches in unengaged villages and among unreached people groups. There are 3,000 such groups in Africa with a number of them not far from R.A.U.. In September we want to bring in our first groups of pastors to the Guesthouse/Hall of Tyrannus. We also wanted to have a place for teams to come on short term mission trips and share their gifts with the people. Currently we have three American teams and one from Kampala coming. 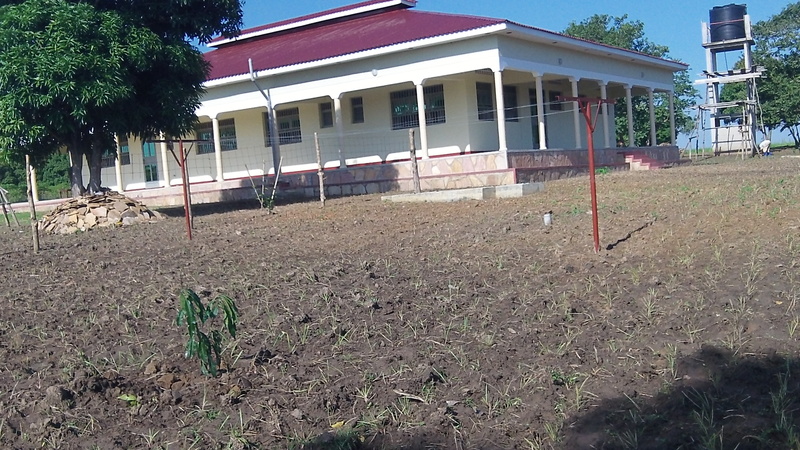 Because of gifts and prayers of many we are closing in on completing Phase I with the finishing touches to the Guesthouse/Hall of Tyrannus, work on the grounds around the Guesthouse, planting of fruit trees (97 planted so far) for a future income for the ministry, and Tukalu guest quarters. Praise God for His abundant grace, provision, and the people who have helped make this happen. We continue to ask for your prayers and generous support to carry out the vision and mission given to us by Christ. We are seeking to be good and wise stewards of what is given us making every dollar stretch to the maximum for God’s glory and spread of the glorious gospel to the unreached! Thank you very much! 1. 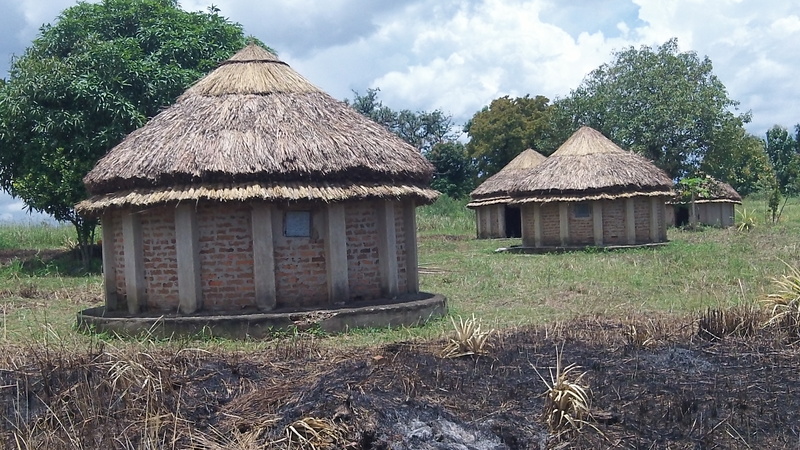 Finishing up the refurbishing of our four existing tukalus on the land. The four have now been roofed with new grass. To repair the doors, windows, and plaster them will require an additional $1000. 3. $1000 to dig a pit a new double stall pit latrine for the tukalu quarters with an outdoor bathing facility. The existing pit latrine is about to cave in and there is no place to bath. 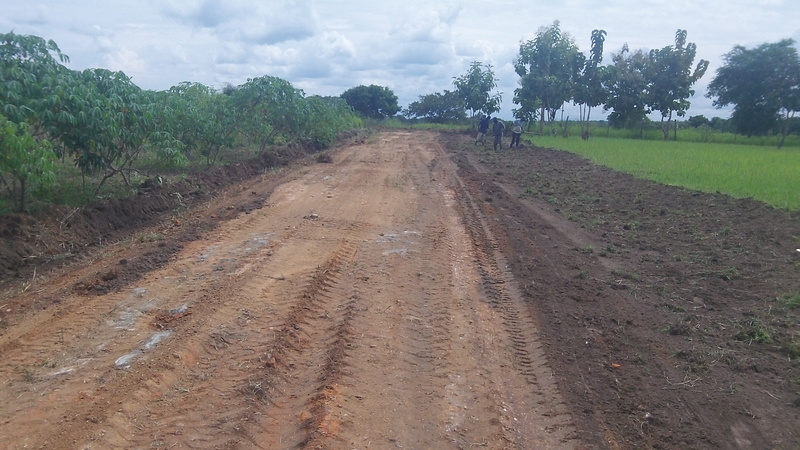 (See our previous newsletters on the reason we are building these tukalu quarters ). 6. Prayers for the safe arrival of the Land Cruiser which is on its way from Japan. Prayers for continue protection, wisdom, good health, and anointing in our teaching and evangelism. God’s most gracious providence and favor has been shown on our behalf yet once again! I am reminded of a sermon I preached from Esther 6:1 on the loving providence of God. I rest and sleep in peace each night because the God of the Bible is indeed sovereign and rules over all things! This scriptural truth brings great comfort to my heart and encouragement as we work to bring glory and honor to King Jesus! 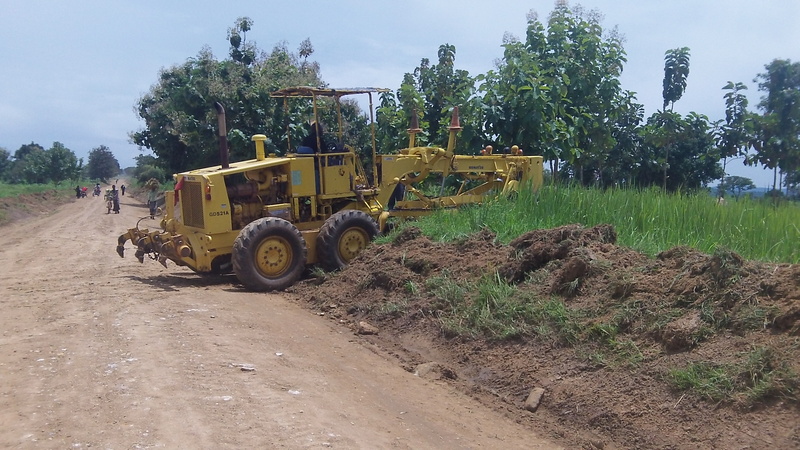 “It just so happened” that the road grader which works on the road in front of R.A.U. around once a year was near. “It just so happened” I met a man at church where I preached , who is a brother in the Lord and who is in charge of road maintenance. “It just so happened” that when I told him we had a container coming which could not make the turn into R.A.U. 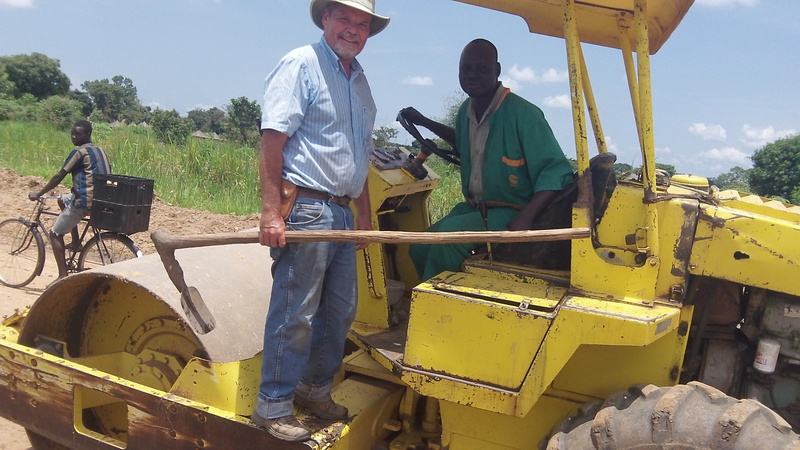 he volunteered the grader he “just so happens” to supervise. He “just so happen” to volunteer the grader to widen our driveway entrance and to smooth out our driveway. All this just for the cost of the fuel! 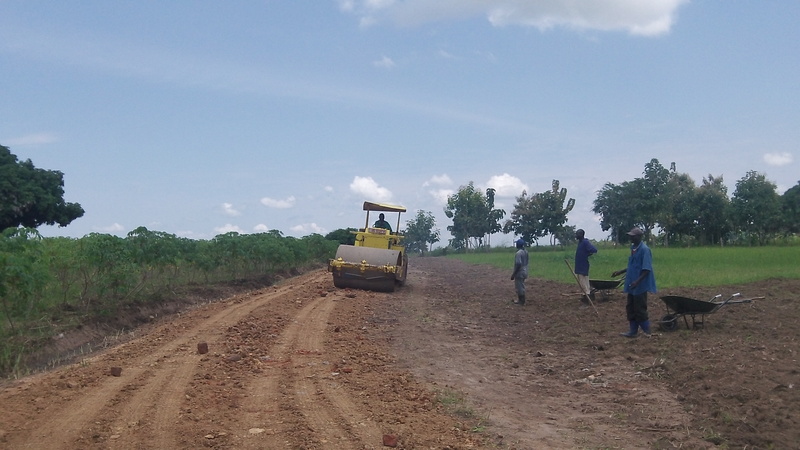 Widening our driveway entrance so that our 40′ container will be able to enter when it arrives. “It just so happened” it was not raining when the grader worked on our driveway in the midst of the rainiest month of the year when the grader was here working on our driveway. 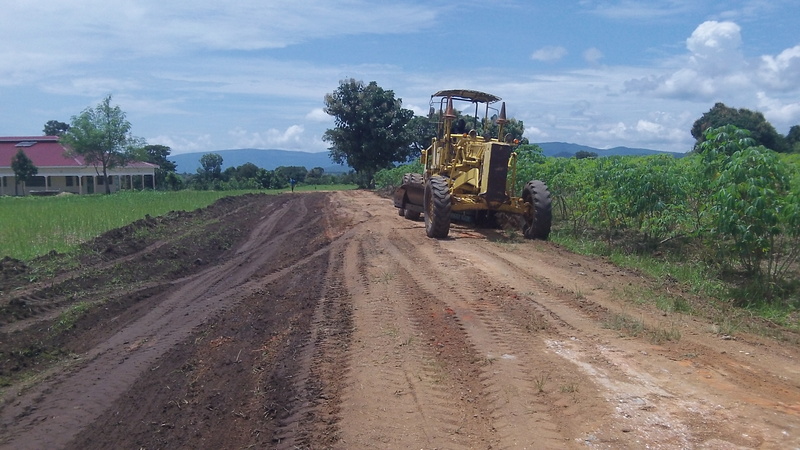 “It just so happened” that after the grader “just so happened to finished” a torrential monsoon rain hit hard. And lastly, “it just so happens” that a roller was coming down the road packing it and will park at R.A.U. and roll/pack our drive in the morning. It is always the right time to make a friend! We were able to level out 7 loads of miram (a sandy/rock/clay mix) before the roller arrived. God’s abundant grace, mercy, and love has been given once again to us…thank you Lord and thank you all who are praying for us! RAU’s new widen entrance…thank you Jesus! “The lot is cast into the lap, but its every decision is from the LORD” (Pro. 16:33). “God’s works of providence are his most holy, wise, and powerful preserving and governing all his creatures, and all their actions” (Westminster Shorter Catechism Q.11). If Creation was a unique exercise of divine energy causing the world to be, providence is a continued exercise of that same energy whereby the Creator, according to his own will, (a) keeps all creatures in being, (b) involves himself in all events, and (c) directs all things to their appointed end. The model is of purposive personal management with total “hands-on” control: God is completely in charge of his world. His hand may be hidden, but his rule is absolute. Some have restricted God’s providence to foreknowledge without control, or upholding without intervention, or general oversight without concern for details, but the testimony to providence as formulated above is overwhelming. Clear thinking about God’s involvement in the world-process and in the acts of rational creatures requires complementary sets of statements, thus: a person takes action, or an event is triggered by natural causes, or Satan shows his hand – yet God overrules. 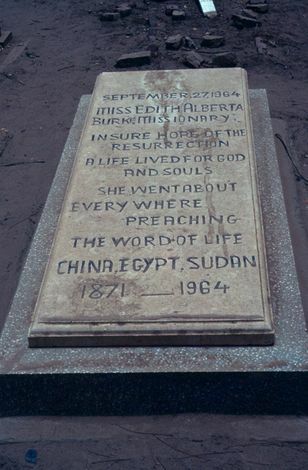 This is the message of the book of Esther, where God’s name nowhere appears. Again: things that are done contravene God’s will of command – yet they fulfill his will of events (Eph. 1:11). Again: humans mean what they do for evil – yet God who overrules uses their actions for good (Gen. 50:20; Acts 2:23). Again: humans, under God’s overruling, sin – yet God is not the author of sin (James 1:13-17); rather, he is its judge. The nature of God’s “concurrent” or “confluent” involvement in all that occurs in his world, as – without violating the nature of things, the ongoing causal processes, or human free agency – he makes his will of events come to pass, is mystery to us, but the consistent biblical teaching about God’s involvement is as stated above. Of the evils that infect God’s world (moral and spiritual perversity, waste of good, and the physical disorders and disruptions of a spoiled cosmos), it can summarily be said: God permits evil (Acts 14:16); he punishes evil with evil (Ps. 81:11-12; Rom. 1:26-32); he brings good out of evil (Gen. 50:20; Acts 2:23; 4:27-28; 13:27; 1 Cor. 2:7-8); he uses evil to test and discipline those he loves (Matt. 4:1-11; Heb. 12:4-14); and one day he will redeem his people from the power and presence of evil altogether (Rev. 21:27; 22:14-15). The doctrine of providence teaches Christians that they are never in the grip of blind forces (fortune, chance, luck, fate); all that happens to them is divinely planned, and each event comes as a new summons to trust, obey, and rejoice, knowing that all is for one’s spiritual and eternal good (Rom. 8:28).